**** Chosen by Winner: Sharon C.
Introducing our second Button Lock Folder design by Miles and Anna Wirtel with a Wave Stainless Damascus blade and Titanium body. This knife is 4” closed with a 3” blade and pocket clip. 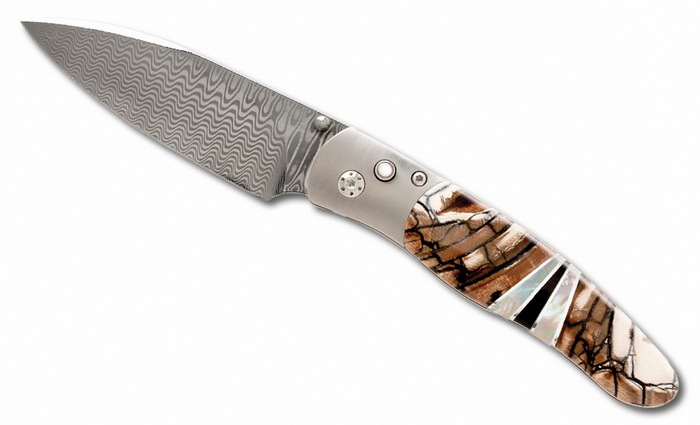 This knife features a handle with inlaid Woolly Mammoth Tusk, Black Lip Mother of Pearl, Abalone and Zinc. The lock button is inlaid with Pearl. Comes in a wood display box.